It was The Most Hon. Michael Manley, Prime Minister of Jamaica in 1972 who announced a programme whereby the importance of labour to the development of Jamaica would be marked by a day of voluntary community participation in projects of benefit to the country; A Labour Day. Over the years, community development continues to be a focus of the government. Yearly, a number of initiatives are embarked on to improve the social and physical conditions in a number of communities islandwide. The Jamaica Social Investment Fund is the principal stakeholder in financing the upgrading of physical and social infrastructure, community capacity development and the provision of social services in under-served communities. 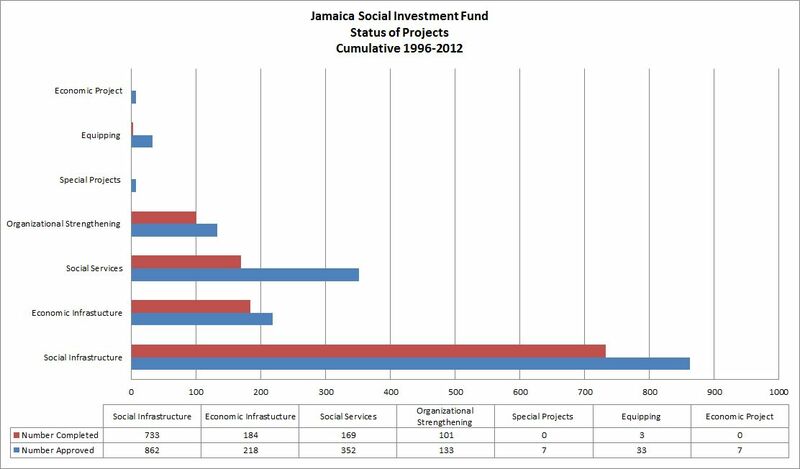 Chart of the Week is a clustered bar graph which shows the Jamaica Social Investment Fund, Status of Projects, 1996-2012. Since inception in 1996, JSIF has approved 1,612 projects of which 1,190 have been completed; the JSIF has contributed to a tune of approximately $7,776.3 billion of the total project cost. The total project cost includes the community’s contribution as well. In 2012, a whopping 151 projects were completed at a total cost of approximately $1.5 billion, of which $200.9 million represented contributions from the beneficiary communities. As in years gone by, most of the projects completed in 2012 were in the social infrastructure area and an estimated 96,785 persons were beneficiaries of the projects that were completed during 2012.
diGgers we encourage you to get involved in a social group or charitable organization as a volunteer not just for Labour Day but to lend yourself whenever necessary as we work together as a nation to have a developed country. To get you started check out DOGOODJAMAICA.org which is an online information portal for and about civil society organizations in Jamaica.